Hi guy's and gal's, just wondering if anyone knows of a good mobile GPS app for keeping a record on where you yak? Kayaks: Hurricane Skimmer; Racing TK1 (Mr Tippy). Welcome to the forum Woody. That's a question that's been stumping me for ages. I can't give you an answer other than fitness tracking apps will do that but the ones I've tried so far all seem to chew through battery too fast to record a lengthy session. My phone goes from full battery to very low in about 2 hrs (enough for my fitness running but too little for a fishing session). Only because it may save you time, Google tracks you and you but does not seem to update data constantly so is not useful for your purpose. Likewise, if anyone has an answer it would be appreciated. I spend some time in NZ and they have some great ones. One in particular is IHikeGps-NZ. It uses the Government topographical maps and has sufficient detail to do this. Records trails, times and lets you put in waypoints and way more. Runs off satellite and doesn’t need phone reception. It’s mainly for hikers and has 50K topographical maps. The features are brilliant and can be used for what you want. When I was there last time I noticed they had all the Australian maps as well. I downloaded them only to find they were 250K and had nowhere the detail needed unless all you wanted was a street directory. I know there are four wheel drive apps that you pay for that might do the job, but have never been willing to pay for them just to see how good they are. Has anyone used them? Kayaks: 2012 Hobie Tandem Island "SIC EM"
I didn't realize that navonics can be downloaded to Google Earth . How do we do this. Avoid 'Boating Maps & Fishing Point Charts' app. If its not useless, its only one step away. The tracking part uses Google Maps which gives a tracking line in your history that indicates is records location (smart?) continually rather than continuously. To get a track line like Tony Stott's example you need continuous location recording. It may work for marking where you catch fish but I gave up before testing that due to the terrible interface. Never tried Geo Tracker. Note your battery level before you start, time taken for the walk and battery level when you finish. I would be interested in your results. bop34 wrote "I didn't realize that navonics can be downloaded to Google Earth . How do we do this." Unfortunately I don't have a currently saved track I can use to build up the instructions, but I recall that once you have saved tracks (or routes, can't recall which), the menu gives you the opportunity to export to Google Earth. 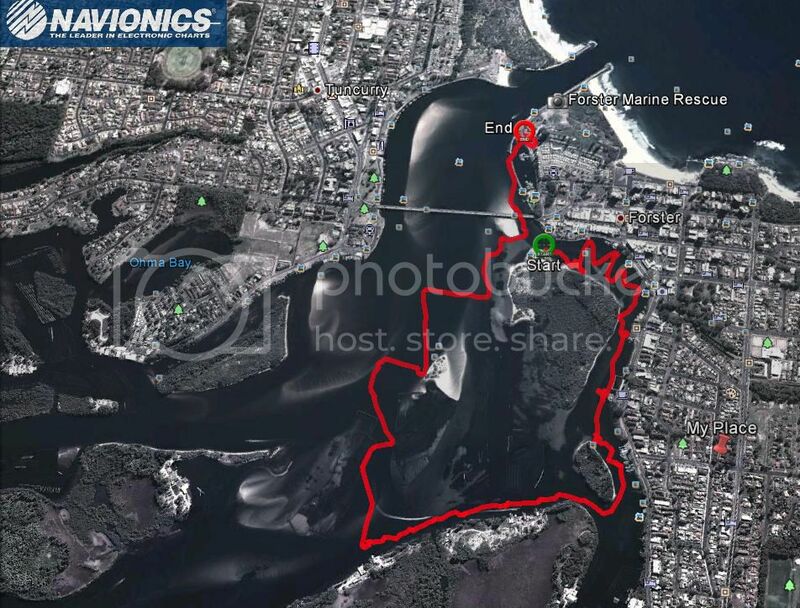 The above image is undoctored, as created automatically, showing the track as recorded by the GPS in the phone app. I use Geo Tracker around the farm and when plotting fishing tracks its good but does tend to chew battery , may need to look at a backup power supply ???? "Life is good if beer is cold"
The HEMA app is more designed for bushwalking or driving in remote areas but the mapping/tracking function works well and it can be viewed online and sent off to a third party. It uses a range of maps including the HEMA ones, can have waypoints and places of interest pinned by the user as well as pictures taken by the phone and included in the track. It could be used to track progress around a lake or alomg the coast or an inlet although its not what it was designed for. At 49.99 for a permanent lecence on Android its not the cheapest, but this is a permanent licence rather than a monthly subscription so I don't mind paying it as a once off. Needs a phone with GPS but I cant really comment on how quickly it drops the battery as I normally have the phone on a charger while I'm using the app. Don't recall it draining the battery to much. Sorry guy's, been flat out like a lizzard drinken, had a walk yesterday and remembered to use the said app , 33 mins battery drained 5%. Would post a screenshot of info from the app but it's too big to format to share apparently . Cheers woody. Thanks. Your words more than adequately cover it without the need for a screen shot. Last year I tried running once with a GPS locator that enabled my wife to see where I was in addition to my run tracking program. The combination was incredibly heavy on battery and the phone almost functioned as a hand-warmers. I've started wondering about a tracking device that can be installed out of sight in the kayak that would function as a theft tracker as well. So far the annual account fees are a deterrent. Generally, I don't mind paying for something but resent paying anything that resembles installment payments. There are other issues, as well. Waterproof and charging requirements both being significant.